You are here: Home / News / schools / early years / Dinosaur Infant! Jon worked with the two Reception classes at Woodlands Infant School in Shirley earlier this week. 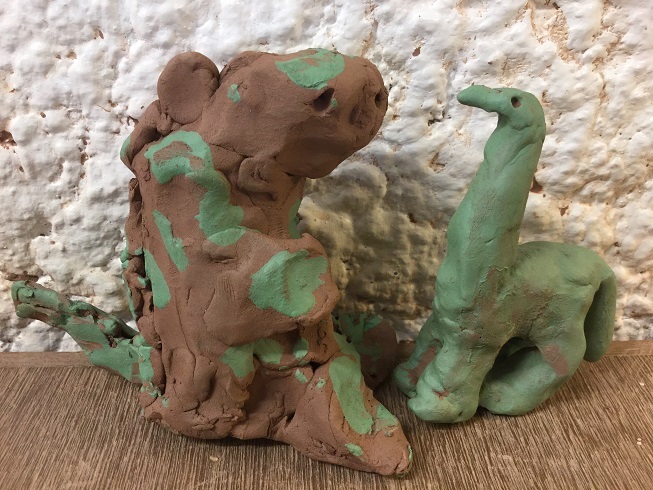 The four and five year old pupils have been studying dinosaurs as part of their learning and were really really excited about making their own pottery creation. Making clay dinosaurs has to be one of our favourite themes of all time. Probably, in part something to do with our son’s obsession with all things Jurassic when he was a youngster. The children used the simple technique of sticking two pinch-pot bowls together to make a hollow structure. Next they fashioned their hollow ball, without breaking the seal into a dinosaur of their choosing, using an additional lump of clay to make legs, spikes, horns etc. http://eastnorpottery.co.uk/wp-content/uploads/2019/03/eastnor_pottery_header_2019-3.png 0 0 admin http://eastnorpottery.co.uk/wp-content/uploads/2019/03/eastnor_pottery_header_2019-3.png admin2019-01-28 14:47:292019-03-17 14:48:13Dinosaur Infant! Fluttering lashes and peacock tails What our customers do when they’re not making pottery….